Proteins play a fundamental role in our day-to-day lives. Thanks to proteins we can speak, move about and think; they protect us from disease and repair damage to our bodies. Proteins are also becoming more popular as active pharmaceutical ingredients: in 2012, the market share of biopharmaceuticals in Germany was 21% (figures from German-language report “Medical Biotechnology in Germany 2013”). To understand how proteins regulate biochemical processes – and thus derive potential treatments for diseases – we need to know the fundamentals: details of the amino acid sequence and the type, number and locations of amino acid modifications. As just one example, while Austin Syndrome patients do in fact produce sulphatases, they lack an enzyme that modifies an amino acid in these enzymes. Accordingly, the sulphatases cannot fulfil their function in the body. Today, the primary tools for addressing these kinds of complex problems are mass spectrometry methods . Protein analysis uses the following procedure: Following extraction and purification, the proteins undergo enzymatic cleavage, preferably with trypsin, a protease that cleaves at the C-terminal side of arginine and lysine. This process generally takes several hours to complete. The resulting complex mixture of cleaved peptides is then separated using high-performance liquid chromatography (HPLC). The utilisation of affinity chromatography enables the targeted enrichment of peptides with specific post-translational modifications – such as biotinylations, phosphorylations or glycosylations – while reversed-phase (RP) chromatography enables the separation of peptides due to their hydrophobicity. Following this, a mass spectrometer is used to analyse the eluted peptides. The ionised peptides are transferred into the gas phase and subsequently separated and detected according to their mass-to-charge ratio (m/z) in the high-vacuum. Fig. 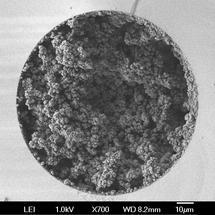 1 Electron micrograph of a monolithic stationary phase inside a fused silica capillary (inner diameter 100 µm). See  for for preparation conditions. A peptide’s amino acid sequence is determined by the application of a fragmentation experiment during tandem mass spectrometry (MS/MS). This involves isolating a peptide with a specific mass-to-charge ratio and then causing it to collide with a neutral gas: this results in amide bond cleavage along the amino acid backbone. The resulting fragment ions – termed b-ions and y-ions – enable the determination of the amino acid sequence in the peptide and thus the protein. The technique can also determine the type and location of post-translational modifications. Automation can be used to accelerate this extremely time-consuming procedure; one particular bottle-neck here is the process of enzymatic cleavage. The deploy­-ment of enzyme reactors can significantly accelerate the enzymatic cleavage step. 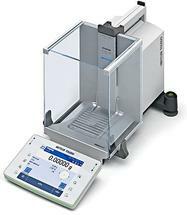 Then again, the completion of multiple chromatographic separation steps also prolongs analysis time, while the sheer number of manual pro­cessing steps can result in contamination and sample loss. These problems can be reduced by the application of multidimensional HPLC, which directly links together the individual and complementary separation dimensions. Fig. 2 Schematic diagram of the three-dimensional HPLC system with direct coupling to a Q-TOF mass spectrometer (from , copyright 2013, Springer). Cf. for details of the experimental procedure. In recent years, monolithic stationary phases have seen increasing use in liquid chromatography [2, 3]. Monoliths are manufactured by the polymerisation of monomers in the presence of inert solvents and exhibit a sponge-like structure (fig. 1). Monolithic media offer a number of advantages when compared to conventional particle-based chromatographic supports . Since the liquid polymerisation mixture can be filled into containers of any shape of container, capillary columns can be manufactured both simply and cheaply. In addition, the monolith’s pore properties can be tailored to specific requirements by selecting the solvent and the mixing ratio as appropriate. In contrast to particle-based columns, backpressure is lower for columns of the same diameter, thereby enabling higher flow rates and thus shorter analysis times. Monoliths also feature rapid mass transfer, due to the convective flow within the highly irregular structure of the sponge-like monoliths. This improves separation properties or – in the case of enzyme reactors – the reactor’s efficiency. This approach enables the enzymatic cleavage of proteins within a residence time less than four minutes using a monolithic trypsin reactor, while cleavage in solution can require up to 24 hours . Immobilisation also stabilises the enzyme’s tolerance versus denaturing agents. Even when 6 M urea is used, trypsin is still not deactivated; with cleavage in solution, this would already be the case at urea concentrations higher than 1 M.
Fig. 3 A Extracted ion chromatogram of the identified biotinylated peptides. B Fragmentation mass spectrum of a biotinylated peptide. The mass of the fragment ions y1+ and y2+ (blue arrows) plus b6+ and b7+ (red arrows) enables the unambiguous localisation of the biotinylation at lysine 86 of cytochrome c (from , copyright 2013, Springer). 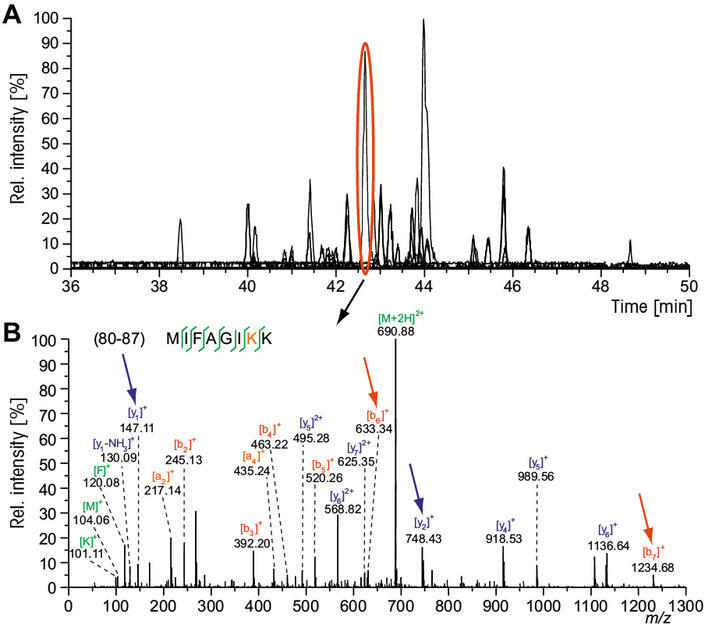 For the analysis of biotinylated proteins, a 3-dimensional nano HPLC system (flow rates of 300 nL/min and 500 nL/min) was set up with 3 separate chromatographic columns and coupled directly to a quadrupole time-of-flight (Q-TOF) mass spectrometer with electrospray ionisation (ESI) (3D-nano-HPLC/nano-ESI-Q-TOF-MS/MS, schematic diagram, fig. 2) . In the first dimension, the monolithic trypsin reactor was used to cleave the injected proteins. Following this, the cleaved peptides were then then transferred to the second the second dimension: a monolithic affinity column used for the enrichment of the biotinlyated peptides . This affinity column exploits the properties of monomeric avidin to bind biotin reversibly. The targeted enrichment of the biotinylated peptides significantly enhances the sensitivity for the analysis of these peptides. In contrast, the simultaneous analysis of biotinylated peptides alongside non-biotinylated peptides makes it harder to identify the less abundant biotinylated peptides. No analysis of the non-biotinylated peptides is carried out: only the biotinylated peptides are eluted and subsequently separated using reversed-phase HPLC and analysed with a Q-TOF mass spectrometer. 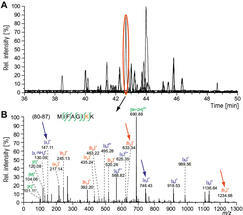 Figure 3 shows a chromatogram of the extracted ion profiles for the peptides identified using this method . The biotinylated protein was present in a mixture with an excess of non-biotinylated proteins. Although the biotinylation was induced artificially and a large number of possible biotinylated peptides were therefore present (all at varying concentrations), it was possible to identify 22 peptides, of which 19 were biotinlyated. Non-biotinylated peptides were rarely identified, as were peptides of the excess proteins. Use of the automated, three-dimensional HPLC-MS system made it possible to complete the analysis and identification of the biotinylated protein within a period of 2 hours and 15 minutes. In contrast, an analysis based on carrying out the individual steps would take 2–3 days. 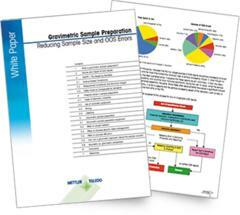 a separation medium, they are simple to make and have a wide range of applications. They work equally well for capillary column analysis or applications requiring a large column diameter for preparative product isolation. For miniaturisation (“lab-on-a-chip”), monolithic columns are especially superior to particle-based columns. Today, the direct coupling of multiple separation dimensions is not performed routinely, as it presents major challenges in term of technical equipment. Mass spectrometry, on the other hand, has become an indispensable part of protein analysis in recent years. One key reason for this is the rapid development of mass spectrometry methods: from the analysis of protein complexes with a molecular weight of several hundred kDa to peptide sequencing, (almost) anything is possible today. First publication: Sproß, J., q&more, 2.2013.